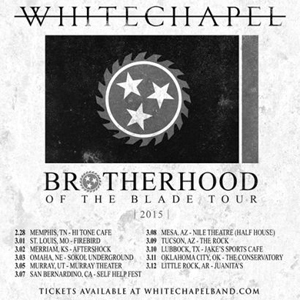 WHITECHAPEL have announced the Brotherhood Of The Blade tour, scheduled to kick off at the end of February. The tour will run from Memphis through the Midwest on their way to Self Help Fest in San Bernardino, CA. The Self Help Fest is scheduled for March 7th at the Nos Event Center and features THE DEVIL WEARS PRADA, PIERCE THE VEIL, STICK TO YOUR GUNS, THE GHOST INSIDE and more.